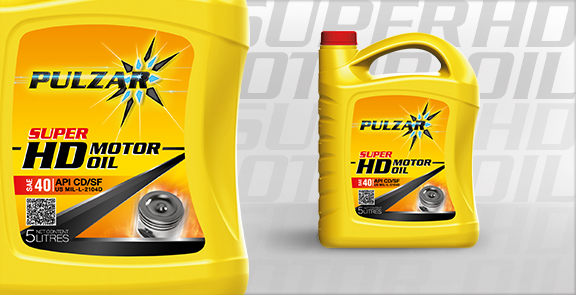 PULZAR SUPER HD MOTOR OIL is balanced blend of select high performance, high VI base stocks. It offers excellent protection for modern passenger car and light diesel engines by exceeding motor oil performance requirements for such engines. With PULZAR SUPER HD MOTOR OIL, engines consume less oil and experience less ring breakage and piston skirt scuffing. The acid-neutralizing additive in PULZAR SUPER HD MOTOR OIL will also reduce corrosive wear, even when using fuel with sulfur levels up to twice the national average. Less corrosion deposits and wears mean less engine maintenance and longer engine life. PULZAR SUPER HD MOTOR OIL exceeds the performance requirements of all diesel engine manufacturers specifying the use of an engine oil meeting API Service Classifications CD and SF, CD/SF or any combination. It is available in SAE 30, 40 and 50. Viscosity recommendation varies according to temperature and engine manufacturer. Always refer to the vehicle owner’s manual for correct viscosity.